Janitors in barbershops from New York to Los Angeles collect hair for the Paul-Lewis Laboratories at Milwaukee, Wis., where it is reduced to the white precipitate. 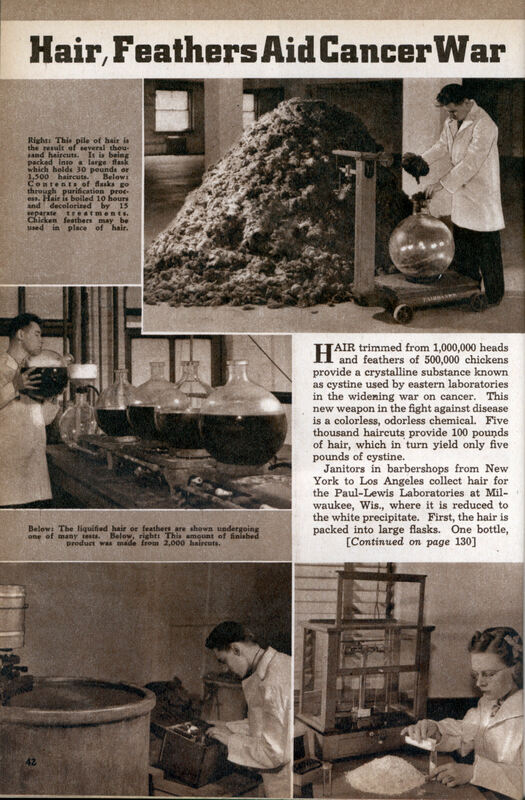 First, the hair is packed into large flasks. One bottle, filled with 30 pounds, represents 1,500 haircuts; or it may contain selected feathers from 800 chickens. The hair is boiled 10 hours and cooled overnight. Then, after being filtered, neutralized, decolorized by 15 separate treatments, and washed in alcohol and ether, the cancer-fighting precipitate is finally purified. Notice that no one is wearing a mask?